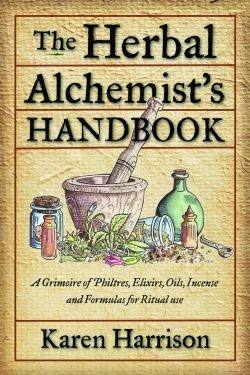 In The Herbal Alchemist’s Handbook, an expert combines the twin arts of alchemy and herbalism to create mystical, magickal (her spelling) “philters, elixirs, oils, incense, and formulas for ritual use.” This straightforwardly entertaining guide serves equally well as an introduction to these concepts for the uninitiated and a manual for those already inclined. It all becomes more comprehensible when one reads Harrison’s many well-organized examples, lists, and guides for using herbal alchemy in practical ways. To activate the essence of herbs we can manufacture incense, oils, bath herbs, amulets, and potpourri that provide strength in areas where we lack. For example, someone who has many air signs in their astrological chart may seek to achieve balance by accessing earth elements for stability. Following Harrison’s directions, a concoction may be made using the herbs associated with the earth signs. The author’s instructions for making a “protection amulet” call for these components: a six-inch square of black cloth, one yard of white cord, four protective herbs (such as rue, garlic, coriander, and patchouli), and one protective stone (such as smoky quartz). One needs an altar, or workspace, of one’s own devising and must focus thoughts and energies on strength and protection when placing the herbs and the stone, warmed by one’s hands, in a bag made by folding the cloth in at the corners and tying it with the cord. The bag may then be placed wherever protection is required—in the car, closet, or lock-box. In the model above, the significance of color (black for shielding, white for purification) and numerals (4 herbs, 4 corners = 8 for power) also come into play and are detailed in Harrison’s text. Like the protection amulet, most of the author’s formulas and recommendations combine different disciplines: astrology, herbal science, psychology, astronomy, numerology, and sacred ritual. Herbal remedies, bath oils, and incense are common enough these days, and are often available at the supermarket or pharmacy. But Harrison offers a wider understanding of the ingredients behind the products, inviting readers to delve deeper into a mystical world in order to create and manipulate ancient energies for personal improvement.